4th Meeting of CC for Silk Roads © Archaecological Expertise, Ltd. 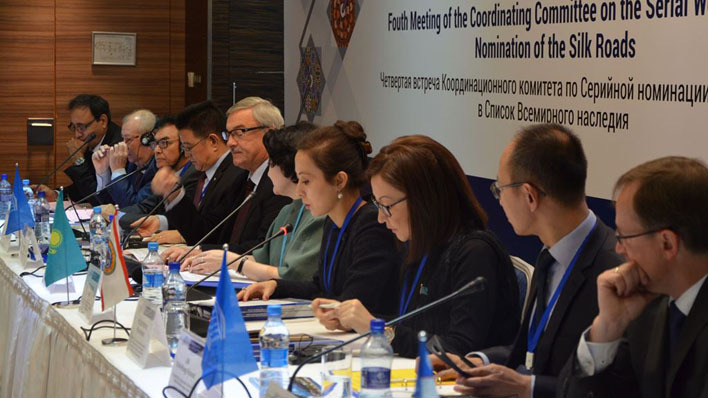 Following the Fourth meeting of the Coordinating Committee on the World Heritage Serial Nomination of the Silk Roads in Almaty, Kazakhstan, 24-26 November 2015, more than 50 representatives and experts from twelve countries together with UNESCO representatives, international experts and representatives of IICC Xi’an (China), on December 22, 2015 the Secretariat of Silk Roads Coordination Committee released a list of recommendations for further activities to pave the way forward for the Silk Roads World Heritage Serial and Transnational Nomination. 4th Meeting of CC for Silk Roads ©Archaecological Expertise, Ltd.
•	to review the progress of the Silk Road World Heritage Nominations processes including the South Asian Silk Roads (Nepal, Bhutan, China and India), the Fergana-Syrdarya Silk Roads Heritage Corridor (Kazakhstan, Kyrgyzstan, Tajikistan and Uzbekistan), as well as other Silk Roads initiatives from Afghanistan, Iran, Pakistan, Turkey and Turkmenistan. The Meeting also reviewed the results of the UNESCO/Japanese Funds-In-Trust (FIT) project “Support of documentation standards and procedures of the Silk Roads World Heritage Serial and Transnational Nomination in Central Asia”, 2011-2014 as well as the UNESCO Korean-Funds-In-Trust South Asian Silk Road project and to officially launch the UNESCO/Japanese FIT project “Support for the Silk Roads World Heritage Sites in Central Asia” (Phase II, 2015-2018). Finally, the Meeting also discussed potential needs regarding further development of the ICOMOS Silk Roads Thematic Study covering Eastern Asia and Western Asia. 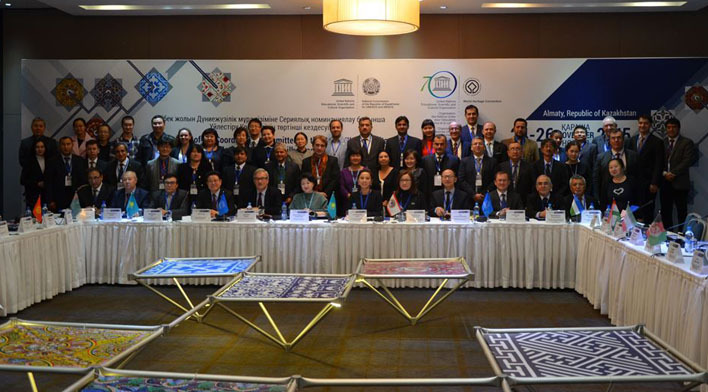 This Almaty meeting was successfully organized by financial contributions from the UNESCO World Heritage Centre Regular Programme, the UNESCO/Japan Funds-in-Trust Central Asian Silk Roads project, the UNESCO/Korea Funds-in-Trust South Asian Silk Roads project, and support from the National Commission of Kazakhstan for UNESCO and ISESCO (under Kazakhstan MFA). The Silk Roads nomination process now includes the following fourteen countries (Afghanistan, China, India, Iran, Japan, Kazakhstan, Kyrgyzstan, Nepal, Pakistan, the Republic of Korea, Tajikistan, Turkey, Turkmenistan and Uzbekistan) that are members of the Silk Roads Serial Transnational World Heritage Nomination Intergovernmental Coordinating Committee, as well as Bhutan as an observer.